Total Shoe Concept was supporting partner of this event (2017) and we can’t wait to share some of the exciting content that we got to see and hear. 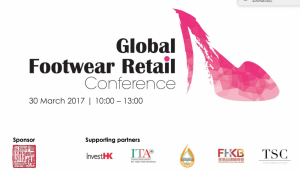 The 2017 edition of GFRC returned to Fashion Access on 30 March 2017 in Hong Kong. Since the launch in 2015, the Global Footwear Retail Conference has been bringing together over 100 key footwear retailers to this annual meeting in Hong Kong to discuss on ground-breaking ideas, latest innovations, technologies and critical issues that are shaping the retail scene. The GFRC is an initiative of APLF. 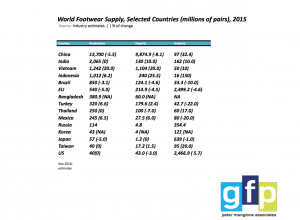 Peter T. Mangione, the managing director of Global Footwear Partnerships LLC starts of with some charts to the footwear industry supply, consumption and a worker cost comparison. 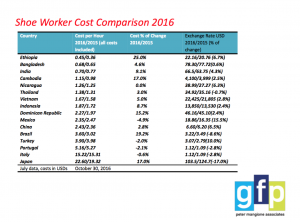 Ethiopia is now cheapest in terms of labour costs where as China’s labour cost are one of the highest. 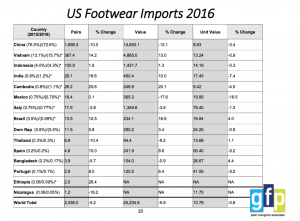 The footwear export of China has gone down as much as the production of all of the footwear production of Vietnam. There is much of a decline in leather footwear. 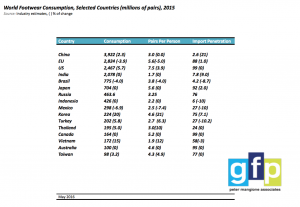 Leather footwear is only 7% of all export but nearly 20% of the decline is leather footwear (275 Million pairs). These pairs are lost to the market not picked up by anybody else. Brands are moving their production to countries as Vietnam because it’s cheaper than China and faster even though the internal supply chain is not very good. But, Peter concludes, China still rules. It remains the source for many shoe categories like woman’s footwear and low price giants. 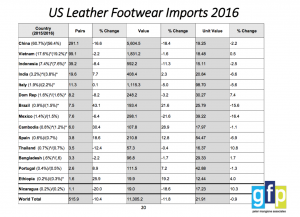 On the other hand sport and outdoor items for export seem to have accelerated their move out of China and shoe production will continue to strengthen in countries like Vietnam, Cambodia, Bangladesh, India, as will as in Ethiopia, Latin America and maybe Myanmar. Peter also shows some interesting charts of the American brands /retailers which clearly show that ONLY athleisure and low price giants undergo a positive growth. 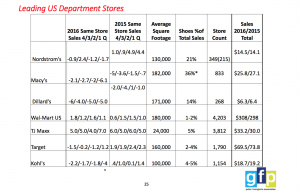 All big retailers loose revenue except TJ Maxx and Wal-Mart US. 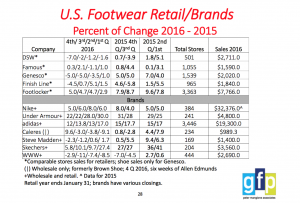 Brands like Under Armour gaining 30% in Q1 and 22% in Q4, whilst Steve Madden is loosing 2.4% in Q4. Internet is crushing department stores; Footwear consumer sales grew by 1% in 2016, with internet sales increasing by 6%, now accounting for 24% of total sales, but the growth rate has slowed. Trumps goal; faster growth. Most of this is speculation, the message we got is that it’s hard to say what Trump is going to achieve and what not. One of the points of discussion is BAT (Border Adjustment Tax), to protect the US manufacturing businesses. This BAT would make the cost of imports subject to the corporate tax. Some claim it will make the dollar stronger where others disagree and say exchange rates move for many reasons. Waiting for Trump’s verdict.